A complete understanding of ovarian follicle (i.e., a sac containing ova) dynamics is crucial in the field of genetic engineering. Monitoring follicles over an entire cycle is especially important in human reproduction. The outcome of a pregnancy depends on the quality of the embryo. This, in turn, depends in part on the quality of the female gamete oocyte contained in the dominant follicle (dominant follicles are those that grow and have potential to ovulate at the end of the follicular phase) and, therefore, the quality of the follicle itself, which supports oocyte growth and maturation. Not all dominant follicles ovulate and of those that do, not all are of sufficiently high quality to result in pregnancy. Here the main task is to successfully characterise dominant follicles from the set of follicles inside the ovary. To characterise successful dominant follicles, the follicles must be compared with unsuccessful dominant and subdominant follicles and their interactions examined. For a comparison to be possible, individual large and small follicles must be identified and their development monitored over a number of days. Follicles can be monitored in several different ways; the best way of monitoring is by using non-invasive methods, e.g. ultrasonography. With the frames of ovary, grabbed on either way, and with appropriate criteria (right shape, antral edge quality, size, and echogenicity) the follicles (and also its type) can be identified and the required analysis accomplished. Today, the monitoring of follicles is done in a non-automatic way, with human interaction. A doctor must examine over 30 women a day during their entire cycle (ultrascan the woman, freeze the ultrasound image in the best position of the ovary, measure every follicle inside the ovary by hand, repeat this procedure for both ovaries---left and right) in order to obtain credible results. This work can be very demanding and inaccurate. An automated, computer-based method is desirable because of the tedious and time-consuming nature of manual follicle segmentation. From a digital image processing point of view, we are dealing with sequences of ovarian ultrasound images with follicles. Consequently, it is a problem of constructing a follicle recognition algorithm, which is able to extract follicles in image-to-image manner, describe follicles with appropriate features (shape, antral edge quality, size and echogenicity), and store results for further comparison. Fig.1: The follicle detection problem. 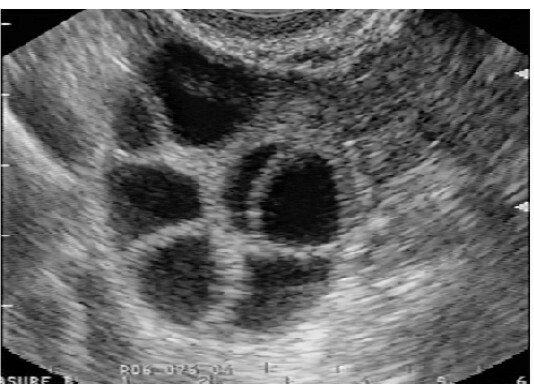 Original ovarian ultrasound image on first image, second image presents desired result (follicles). In our System Software Laboratory, we have been dealing with ovarian follicle detection since year 1995. We developed several techniques more or less successful by the follicle detection. In year 2000 we started to research toward automated estimation of blood around the ovarian follicles. Boris Cigale, MSc in Comp. Sci.